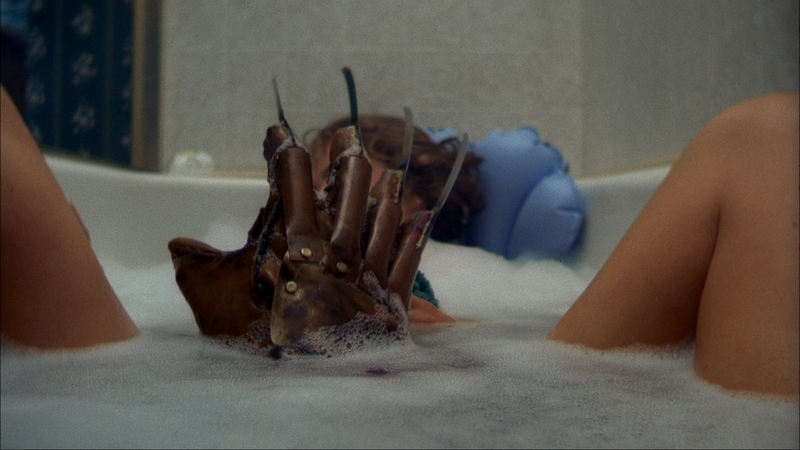 You can easily forgive the genre familiarity of Nightmare on Elm Street early on. Of course the parents won’t believe someone is killing their children in their sleep. It is ridiculous, and the guy behind it all makes it even harder to believe. His first kill is Tina Gray (Amanda Wyss), brutally slashed to pieces while her boyfriend stares in horror. The boyfriend is logically singled out, locked in a cell, and then apparently commits suicide by hanging himself. Freddy Krueger knows how to be subtle. It is the third death where you wish the parents would catch on. Poor Glen (Johnny Depp) never stood a chance, turned into a blood fountain after being sucked into his bed. Do any of the investigators believe a human could pull that off? That is where the genre cliché becomes a bit much to swallow, leaving Nancy (Heather Langenkamp) to fend for herself as Krueger tries to kill her. Unlike the slasher films before it, Freddy is unique. Existing in a dream world, he builds psychological horror first, manipulating himself in various ways or creeping through shadows. Freddy is capable of anything, not just some super-powered brute wielding an axe or a machete. Nightmare opens with an attack sequence, and not just for some bloodshed. The audience feels the same confusion Tina does, with no knowledge of who her attacker is. Nightmare also builds its human characters, Nancy caught between her divorced father and alcoholic mother. Nancy shows her resolve and willingness to fight. She is angry, terrified, and even frustrated that she has no escape. Her mother can be just as horrific, especially as Nancy comes home to the barred up windows. Marge (Ronee Blakley) carries a deep connection to Freddy as well, her own dark side and likely one of the reasons for her drinking. For all of its visceral horror, Nightmare never forgets it is an 80’s slasher movie. Wes Craven’s twisted sense of humor comes into play when paramedics arrive on the scene of Glen’s death. One of the cops turns to the paramedics pushing a stretcher into the home and says, “You don’t need a stretcher up there. You need a mop.” Even if the smart practical effects failed to show off the iconic blood fountain, you could still get the point (and probably a sick chuckle). Not being able to erase those images from your mind, not because of their campy entertainment value but because of their creativeness/effectiveness, is a sign cast and crew did their part. Nightmare continued because of Freddy and what the character was capable of, yet no one forgets the blood fountain. Ingenuity, creepiness, and a desire to truly terrify its audience make Nightmare the icon of horror that it is, not the punch-line spewing sequel machine it would become. Nightmare makes its American Blu-ray debut courtesy of Lionsgate. Those worried about the Canadian Alliance release with a layer of DNR smudged on top can rest their fears. New Line/Warner’s VC-1 encode keeps the mild layer of film grain intact, and with it, some excellent fine detail. Close-ups are generally always stable, producing noticeable texture. High fidelity detail is resolved fully, and hair produces clearly defined strands. Clothing and other objects are likewise delivered cleanly. Watch for Nancy’s bath towel around 34:17; every stitch is fully visible and delineated. Environments are excellent, particularly complex shots of trees and other plants. Despite a high bitrate, the encode does occasionally lose the battle to grain. It becomes pronounced as Nancy and Glen stand on the bridge discussing the history of dreams (55:25), especially noisy against the sky. However, the encode never fully breaks down, even during a hectic shot as Freddy tears apart a pillow stuffed with feathers. No artifacting is noted despite the amount of objects on screen shuffling about. Black levels are superb, only once falling into gray as Tina enters the boiler room to fight Freddy for the last time. The image consistently carries depth and dimension. A point of possible contention is the obviously saturated color. Primaries are ridiculously bright at times. During the funeral, the roses on the casket are to the point of bleeding and Marge’s lipstick makes her mouth appear glowing. When it works, it is fine. The brightly lit oranges inside the boiler room carry a natural vibrancy. When it doesn’t, you are presented with the near-bleeding effect and slightly bronzed flesh tones. The source is in remarkable shape, with few specks to take note of. Even these tend to appear on the sides of the frame, keeping them away from being a distraction. New Line’s audio presentation comes in two forms, a DTS-HD 7.1 mix and excessively quiet mono effort. Focusing on the DTS-HD first, some people have reported synching issues. During the review, none were noted. Audio and video were perfectly timed. That is not to say certain hardware configurations are not experiencing them however. The uncompressed mix truly brings the electronic 80’s score to life. It utilizes all channels to create superb, distinctive panning effects. It carries remarkable fidelity, those electronic piano keys offering flawless clarity with no noted distortion. The compressed mono mix has the benefit of not suffering from any quality discrepancy. Music, dialogue, and effects exist on the same level, although the score is undoubtedly presented better in the DTS-HD mix. Extras begin with two commentaries, the first with writer/director Wes Craven, cinematographer Jacques Haitkin, along with actors Heather Langenkamp and John Saxon. The second features a vast array of participants all recorded separately. Wes Craven returns with New Line founder Robert Shaye, co-producers Sara Risher and John Burrows, composer Charles Bernstein, co-editors Rick Shaine and Patrick McMahon, cinematographer Jacques Haitkin is back again, mechanical effects designer Jim Doyle, make-up artist David B. Miller, historian David Del Valle, and (finally) actors Robert Englund, Heather Langenkamp (also returning), Amanda Wyss, and Ronee Blakley. The back of the Blu-ray does not even list them all. Focus Points is one of two pop-up features, taking the viewer to various behind-the-scenes clips while watching the film. These clips are pulled from other features on the disc. A trivia track is also selectable. Never Sleep Again is a nearly 50-minute documentary showcasing the making of the film in great detail. The House that Freddy Built looks at New Line’s horror movie history, and their small beginnings. The latter runs around 23-minutes. Night Terrors looks at dreams, their history, and theories on what they are. Three alternate endings run about five minutes.